"For Show & Tell today, I brought my juzu beads," I said as I raised them up to show the class. Everyone looked totally stunned. None of them understood what the things were. "Hmmm. That's interesting, Niki. Is it a necklace?" she asked, as she put them over her head. "NO! Please don't do that! Never mind, let someone else go first!" Being a Buddhist, and living in a "Western" civilization, I go through a lot of discrimination, misunderstanding, etc. 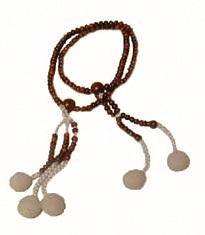 When I was young, I brought my prayer beads to school. No one knew what they were, not even my teacher! I was very upset. That was probably my first experience. But, it certainly was not my last. As I grew older, kids in my classes used to always make fun of me. Or they would ask me stupid questions hoping to demean my religious views. "Do you float? Do you know anyone who floats?" — this was a very common question that kids would ask. What was I supposed to say? "Yes, I float. I also fly around on my broomstick on most Saturday nights!" Now, misconceptions were only one of my problems. When I started to get a little older, the kids just decided to just be mean straight to my face. "You're gonna go to HELL! What do you mean you don't believe in God? Do you worship the devil? My mom says that you're gonna go to HELL!" What a thing for a child of 9 or 10 to hear! Not only are my peers making fun of me, but now parents are telling their kids that I am damned! Now that I look back on those years and those kids, I thank them for what they did. I am a MUCH stronger person now. Although it's easy to say that because I don't hang around with them. Even though they made me stronger, I still remember the years of tormenting, and I wonder, "Why do those kids think that? Why didn't their parents teach them love and understanding? In Christian churches, do they just tell the kids to hate everyone that's not of their religion?" I learned the answers to those questions while I was in middle school. Seventh grade was "my year of understanding." Now, instead of kids hearing that I wasn't Christian and then immediately assuming a whole bunch of things that weren't true, kids asked me real questions! I was so excited. I asked them about their religion. They asked me about mine. It was great! One girl (I don't remember her name) did a Hyper Studio stack about Japan, and ended up getting a lot of information about Buddhism. So, when I told her that I was Buddhist, she was intrigued. She asked me real questions like, "Is there a 'temple' or church in Omaha? How do you pray? Is Buddha your God, or just the founder or what?" It was so nice to have questions that I could actually answer instead of false accusations and stupid, demeaning questions. Now that I'm in high school, I know that all of the torture I was put through helped me. I learned that society isn't always right. Those kids didn't know or care about me, my religion, or my feelings. They just went along with the stereotypes, and the views of the majority. I also learned to "put [myself] in others' shoes." If those kids would've done that for even a second, they could have learned so much! And, lastly, I learned that life and people are rarely ever fair. If life were fair all the time, I would never have been hurt so much. Or those kids would've been made fun of, too. But, they never were. I wonder now about those kids. I wonder if they even remember the torture and torment they put me through. I wonder if they know how it feels to always be the one that people point their fingers at. I wonder if they know how it feels to be constantly laughed at. But, I mostly wonder if they know what it feels like to be "damned to hell!!"